Being a student can be tough, but let’s face it, there’s nothing a few cocktails with your friends can’t solve. 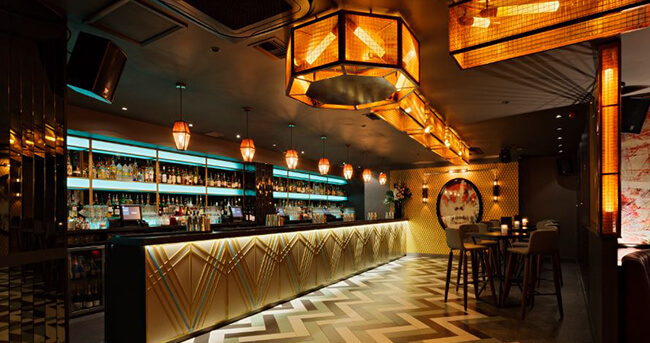 We got in contact with DesignMyNight to give us the lowdown on London’s best wallet-friendly bars; from tiki-inspired dens to venues boasting five-hour happy hours to keep you out and about. 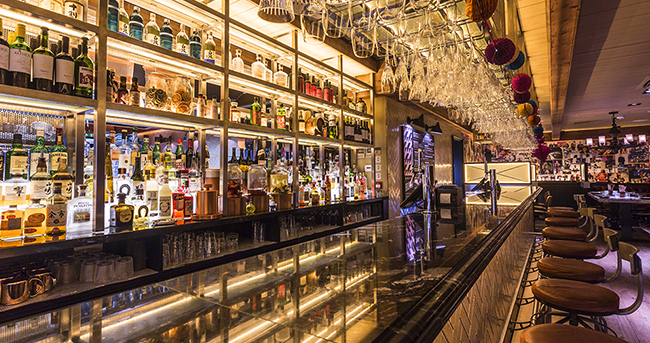 Simmons Fitzrovia is probably one of the quirkiest bars you’ll ever come across. Drinks are served in dainty china and heady concoctions are the norm at this kooky spot. They are also notorious for their lengthy happy hour (4 - 9pm), and outrageous bric-a-brac decor. If you’re a fan of al fresco drinking, you’re in luck too. Order a teapot cocktail at the bar and head out to their cute outdoor garden; it comes complete with a white picket fence and it even has extra heating for those cooler nights. This whimsical joint is a must for those seeking a few budget friendly drinks with friends. Partying in the city can be a bank balance breaker, but if you take a little wander down the back streets of Monument, and descend a set of alluring stairs, you’ll find yourself a dirty little secret. Dirty Martini has a roster of tantalising cocktails at a purse friendly price thanks to their mid-week happy hour. Resident DJs are on hand throughout the weekend to up the tempo, and Saturday night sees their happy hour last until 8pm. Keep an eye on this one, there’s always a plethora of offers on rotation throughout the year. There aren’t many bars in London that sell quality bottles of wine for a reasonable price. But luckily for you, we know of a classy haunt on Greek Street called 68 bar, that does. 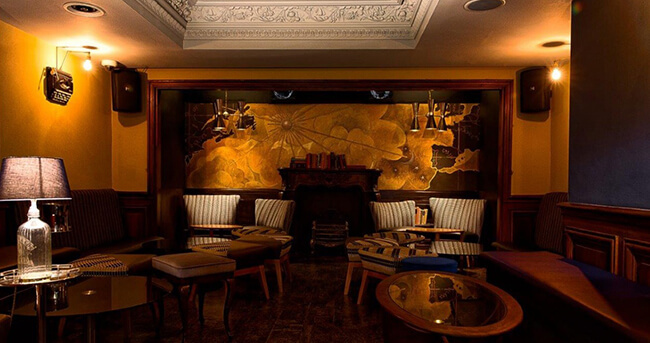 This golden age-inspired bar oozes sophistication and decadence, and is perfect for an intimate night out with the other half, or a group of friends. To add a bit more umph to your night, descend the stairs to Boston; a somewhat hidden cocktail bar that boasts unique and innovative mixology. 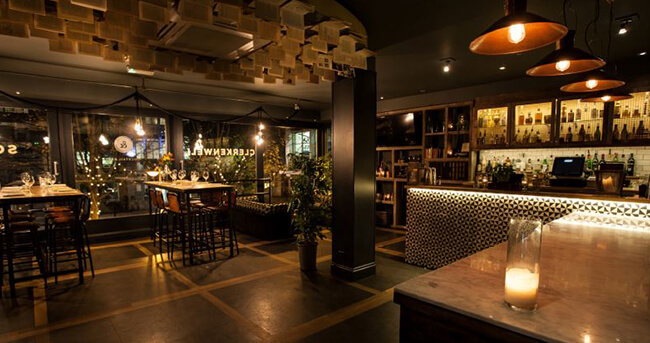 Clerkenwell and Social is a lively, laid back bar on St John’s Square, with a rich literary theme running throughout the venue. This nifty nook offers a daily happy hour where cocktails are 2-4-1, with the same offer extended to their homemade pizzas on Tuesdays and Saturdays. With their spacious outdoor terrace - ideal for those boozy and balmy summer nights - this joint should be at the top of your bucket bars list. And, did we mention that Justin Bieber made an appearance at this cool Farringdon den? If it’s good enough for Beiber, it’s good enough for us. 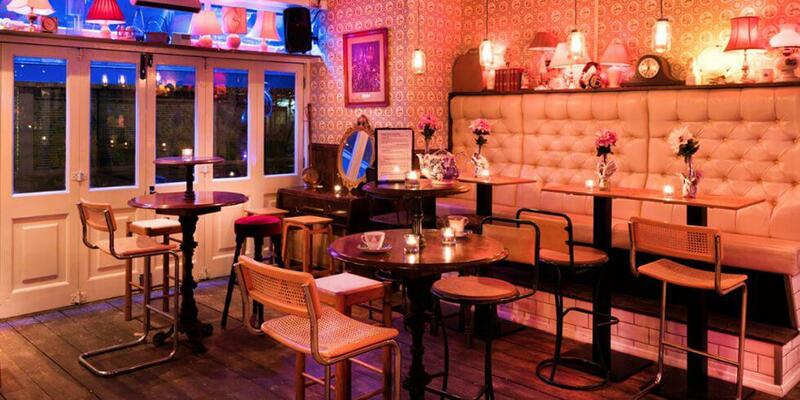 A firm favourite of the barrage of bars nestled along Clapham High Street, this quirky nook is always buzzing. 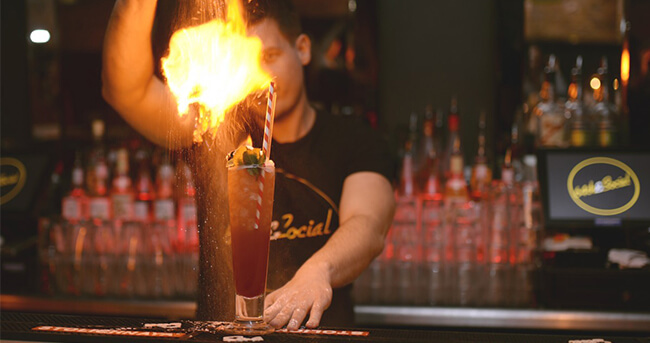 Head down to 64th and Social between 5pm - 9pm any Saturday to get more bang for your buck - cocktails are a purse-friendly £5 each. Don’t worry about getting peckish at this joint, they also serve a selection of grilled bites Monday to Friday. This fun filled haunt isn’t named Adventure Bar for any old reason; neon hot dog signs and ‘party cages’ make this spot a trendy hangout all week long. Venture down to Clapham High Street before midnight during the week, and you’ll get to taste some innovative cocktails for a fiver, and beers for a nifty £3. With a roster of lip smacking eats available - everything from hot dogs to saucy buffalo wings - this is a must stop for boozy shenanigans and party bar vibes. If you’ve ever been to Camden, you’ll know that it’s filled with fun venues that promise plenty of character. Cue Grand Union; a cool and quirky bar situated next to Camden Road Station with tiki-inspired huts and an indoor treehouse. Want some advice? Begin your night here with some saliva-inducing eats, we recommend their hot dogs, pizzas and infamously dribble-worthy burgers. Happy hour commences here at 4pm, a perfect time to get the cocktails flowing. You’ll definitely be partying into the early hours at this nifty spot, so wear your dancing shoes. Mommi is a stylish hideaway nestled on Clapham High Street offering up bespoke Japanese-inspired cocktails, and fruity wines from South America. If that hasn’t enticed you enough, you can get your first round (of up to £40) matched for free when you book through DesignMyNight. There’s no catch folks, just make sure to order before 8pm. 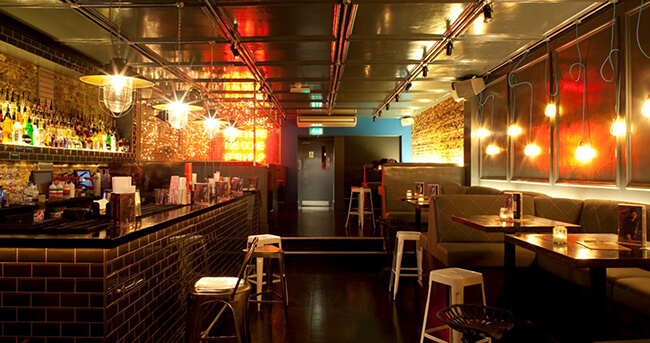 Situated on one of the hippest streets in London, The Shoreditch is an eccentric tiki-style bar oozing culture. 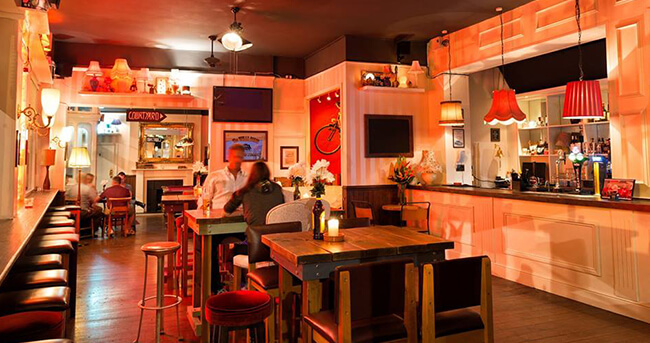 For a raucous night out at a wallet-friendly price, this joint is your go to when in East London Their eight hour happy hour (yes, you read that correctly) is from 2pm - 10pm everyday except Saturdays, and will keep you partying well into the early hours. You might have already guessed this but The Chelsea Pensioner is located in...yep, Chelsea. It’s a quirky pub, home to an array of nooks and crannies to keep you entertained whatever the weather. Happy hour stretches from 4-9pm every weekday where a bottle of wine will set you back a nifty tenner, and a bottle of prosecco, £15. Raucous entertainment is the norm at this trendy spot; they house a karaoke room with its own bar and a 60”TV. Whoever said Chelsea is all about being posh and proper was wrong. 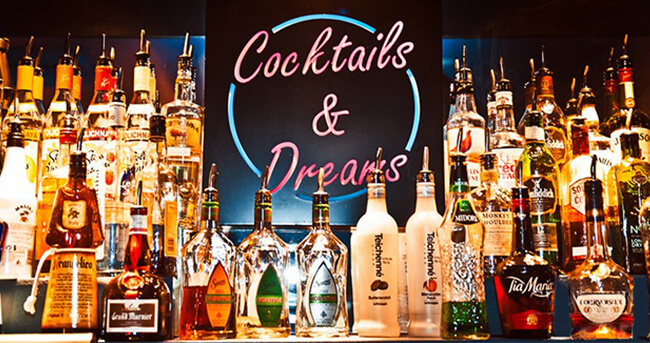 For more of the best bars and what’s on in London visit DesignMyNight; and follow them on Twitter @DesignMyNight!